Just keep swimming | The Tales of Missus P.
Aside from my busy schedule of registering for as many agencies as possible, I still have my driving lessons. The lesson I had right after I heard I had the insane interview to do, I had such a hard time getting into my driving after a two week break. I hated it, wanted to cry and tell the instructor that I quit. I told Steve I wanted to quit too but he convinced me to go through my five pre-paid lessons at least. Last Tuesday, after wanting to just hide in the living room and pretend I didn’t remember my lesson, I faced the music and got in the car. It was fine. I think having a lesson once a week and first thing in the morning really helped. Granted I didn’t do great but I improved. Even the instructor said at one point, “Now that’s how you make a bloody turn!” Making a turn requires early assessment and preparation, especially on hills. I have to use my brain to drive now and not go around on auto pilot like I did for all those years in America with the automatic. This means, I plan on keeping up with my lessons even though it’s going to take me a while. Every British person I talk to tells me it takes three or four times before they pass their driving test — and they’re use to these roads! Even the highway, or the motorway as we call it here, is different. I mean, you’re merging in and out from the left. Naturally I want to look over my right shoulder instead of the left so it gets kind of disorienting. Luckily the guy whose lane I swerved into let me go in front of him. It reminded me of the freeway scene in Clueless — not as bad but I thought about freaking out like that. I had this brilliant idea that I would try out Weebly for a mobile blog while I’m out and can’t set up a proper entry. After seeing the whole thing up I discovered that the badges didn’t work unless I created one via Twitter or Flickr myself, the mobile theme didn’t automatically detect, and there was no support to update posts via email. All kinds of fail. Since I have Missus P. On the Move anyway, I can update mini-posts here and there through email if I want to. I would do it for my this blog but I’m kind of fussy about things being all uniform and consistent. Lastly, I found a place to swim! When I was in Florida, I swam about every day. I only do freestyle but I love exercising that way. The bike and the elliptical (cross trainer) gets boring so finally being able to get a lane at a pool makes me ecstatic. Plus, the place I went to has a smaller pool for the kids so the rest of us can be in our Zen-like state as we swim back and forth. Too bad the pool can get busy but it’s better than the one near our house — that place is too small for the amount of people coming in each day. Oh yeah, and I caught up on my book reviews! This entry was posted in All About Me, Books, Employment, Exercise, Library, Music, Review, School, Technology, Television, Travel, Writing and tagged blogging, book reviews, car, driving, England, librarian, life, Teaching, temp agency, work. Bookmark the permalink. Thanks so much. It has been pretty busy for me lately but at least things are happening for me in some way. 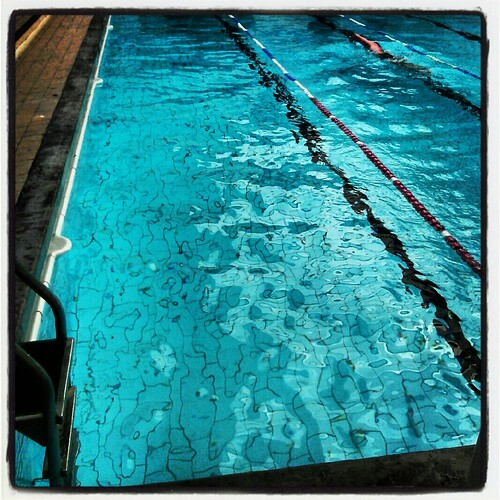 That swimming pool was like visiting an old friend. So nice!